I have to get my house in order. It’s not nesting before you go there. It’s just total chaos. My children have taken over the entire house. There are toys, papers, crafts, and nonsense everywhere. NOT AN OPEN COUNTER to see. It’s just piles and piles of… STUFF. And now that I’m not confined to my bedroom… I see it! My mother came over to coupon for me yesterday and I decided she should take me to Target instead. That way I could pick up some bins to help get my house in order. Well, 2 minutes walking around Target was enough for me. I asked one of the workers if I could use one of those roaming carts and they said yes. As embarrassing as it was, I had to. I was feeling so much pressure (you know where) and couldn’t imagine having to walk the perimeter of the entire store. But boy was I a sight to see. I couldn’t get a handle of the cart. I kept bumping into people, places and things. It was INSANE. And to BOOT — whenever I tried to reverse it would make this beeping noise that was louder than ANYTHING. So, eventually, I told my mother that we can’t reverse anymore. So, if I had to go back a few feet I had to loop around the entire aisle JUST TO AVOID THE BEEPING. It was a reality show in the making. I was mortified. But I couldn’t walk. I just couldn’t and I wasn’t going to take a chance. In the end, I got exactly what I was looking for. I went downstairs to my basement just to see the state it was in and almost fainted. LIKE A BOMB HIT IT. We need to make a few dozen bags for the poor. It’s just too much STUFF. My mother told me to not think about it now and I won’t. That is a project I will handle in June or July – after I’ve fully healed and am sleeping again after this baby is born. 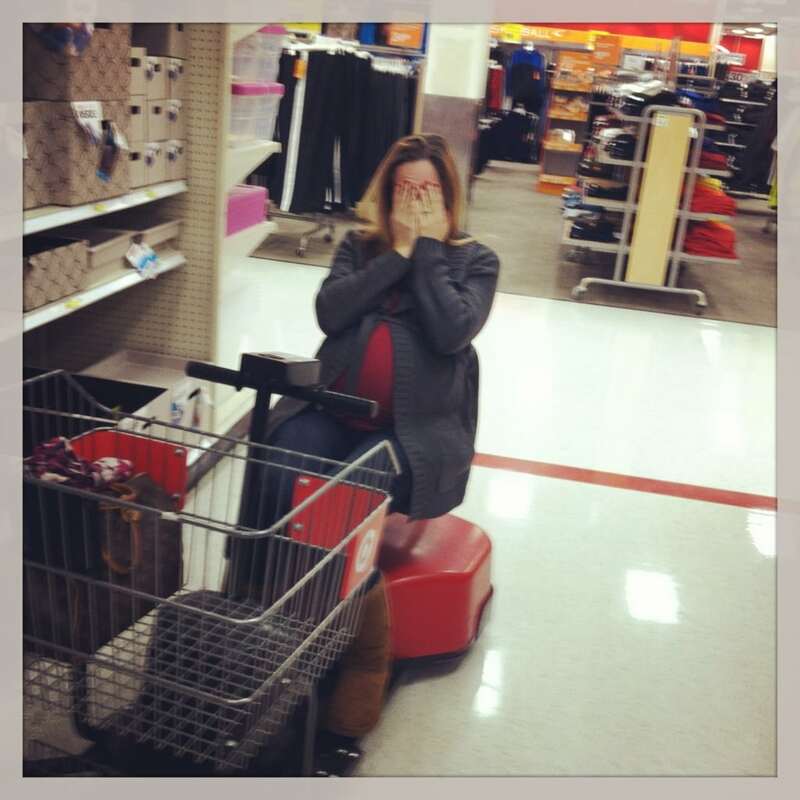 You look so cute in the target car! Little by little the house stuff will get better. I can so relate. I broke my ankle in fall of 2011 requiring surgery and no weight on it for 8 wks. It is so hard to watch your house go to pot. But it will all be ok. I know your pain from riding in the carts too. It was necessary for me…but I hated them. And the fact that they don’t go fast enough for me was horrible too. All I wanted to do when riding in one was get through and get out of there. Hang in there. The light at the end is in sight. Been following your blog for a while…so am anxious to meet this new baby.